BLOX Racing offers a great performance solution for K-series enthusiasts: the K2B throttle body adapter. This adapter allows users to install almost any B/D/H throttle body on to a RBC or RBC-style intake manifold. Now tuners and builders can reap the performance gains by installing BLOX Racing cast or billet B-series throttle bodies ranging from 66mm to 76mm bore sizes. Installation is made simple and quick with included stainless steel hardware and gaskets. Tuners and builder can also take advantage by now using TPS from B-series. BLOX Racing K2B throttle body adapters are CNC-machined from 6061-T6 billet aluminum. 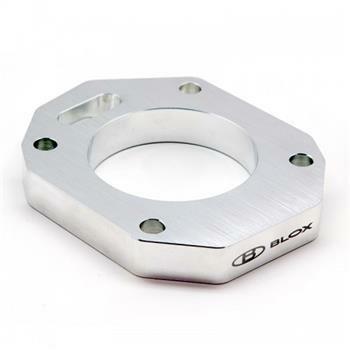 BLOX Racing offers a throttle body adapter for Honda K-series enthusiasts wanting to use the RBC intake manifold while retaining the drive-by-cable operation. In a nutshell, the RBC intake manifold is the best performing manifold for the K-series engine but is hampered by the factory’s electronic drive-by-wire system. Using the BLOX Racing throttle body adapter allows the enthusiast and engine builer to bolt on a BLOX Racing billet K-series or the OEM K20A2 throttle body onto the RBC intake manifold, providing quicker throttle response and intake airflow.